Victoire Barbedette had lost her first husband, Augustin Friteau, and their three small daughters in 1856 during a typhoid epidemic. Alone with her son Auguste, she got married again in 1857 to César Barbedette, known as “Bériot”. Two boys were born from this marriage. Eugène was born in Pontmain on 4th November 1858. 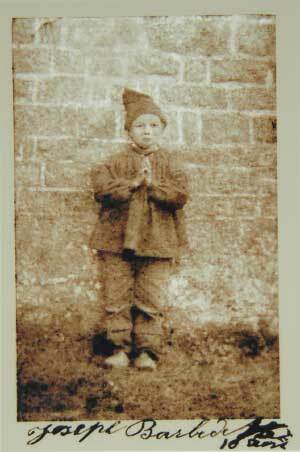 Like his brother, he was taught to pray from a very young age. 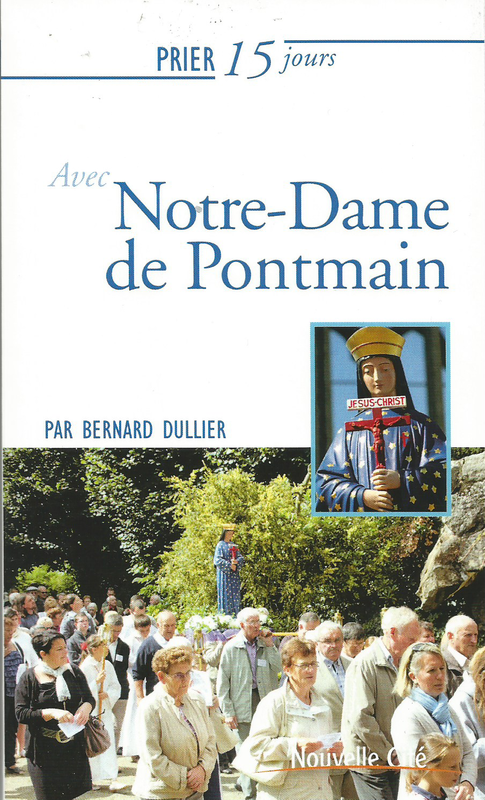 It has to be remembered that at Pontmain the rosary was said each day in every household since the arrival of Father Michel Guérin. Manual work was also part of everyday life. “As soon as we came back from school, all kinds of small tasks were waiting to be done at home. We had to turn the spinning wheel for our mother and for the servant, fray the old woollen rags, crush the gorse in the barn, slice up the beetroot and carrots to give the animals to eat. I remember that this work was quite hard.we never had time to be idle”(Eugène’s words). 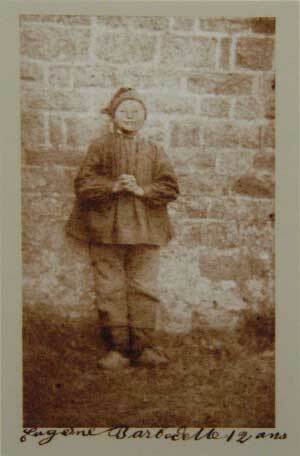 On the morning of 17th January 1871, after working with his father, because he had to replace his elder brother Auguste who had gone off to join the war, Eugène went to church to pray and serve Mass before going to school. In the evening he went back to the barn to work when, going outside to “see what the weather was like”, he was the first to see the Beautiful Lady. Joseph was born on 20th November 1860. He was of a happier, more cheerful disposition than his brother. Like his brother, he had been brought up by Victoire to pray and to work. The upbringing that Victoire gave her children was quite usual at that time. It was the mother who was in charge of bringing up the children. It was not that the father took no interest in his children, but he was busy with his work in the fields whereas the mother stayed at home. He was only brought in as a last resort in cases which were judged by the mother to be sufficiently serious (“I’m going to tell your father”). The usual punishment was a ‘tok’, (a word used in the Mayenne to mean a smack). Slapping was reserved for the small rebels in the towns. In the country, a ‘tok’ was usually given. The word expresses very well what it meant. It was the noise that the gesture made on the cheek of the guilty party. Victoire was known to give ‘toks’ hard and often. Joseph had slept in the barn with Eugène as they were used to doing. Their father had woken them up early, they had worked, eaten their morning soup and then gone to church where they said their morning prayer and then walked the Way of the Cross (this was to fulfil a promise which Eugène had made to Auguste to ensure that he would come back safe and sound from the war) before serving Mass. “Oh ! The beautiful Lady ! How lovely she is”. It was with these words that Joseph greeted the apparition when he came out of the barn just after his brother. 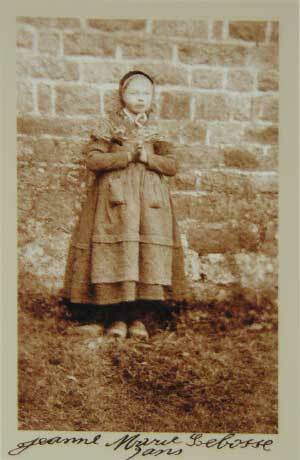 after her birth she was baptised at the church in Gosné by Father Beaulieu, the parish priest. 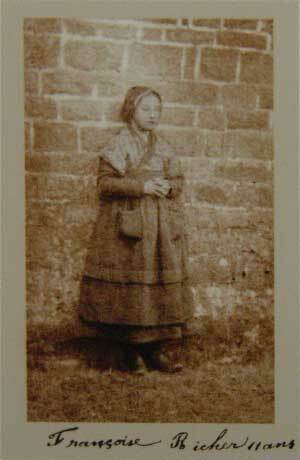 Later on she wrote, “When I was two my father died and my mother became paralysed. I was taken in by my aunt who was the Mother Superior of the Adoring Sisters of the Justice of God who ran a school in Pontmain.” (12th December 1920).This is how Jeanne-Marie arrived at a very young age in Pontmain to live with her aunt Perrine Lebossé, whose religious name was Sister Marie-Timothée of the Cross, and who was born in Laignelet (Ille-et-Vilaine). She was headmistress of the school and also went to people’s homes to give nursing care. For Jeanne-Marie her father’s death and her mother’s illness, which caused her to be sent away, were doubtless a terrible ordeal which left its mark on her from a very young age and which her aunt’s affection could not make up for, in spite of all her efforts. Because of these circumstances, Jeanne-Marie started school very early, which explains her sharp mind. On the evening of 17th January she followed Sister Vitaline and the two other boarders and saw for herself all that happened that evening above the house of Augustin Guidecoq. We know very little about the childhood of Françoise Richer. She was born in 1860. 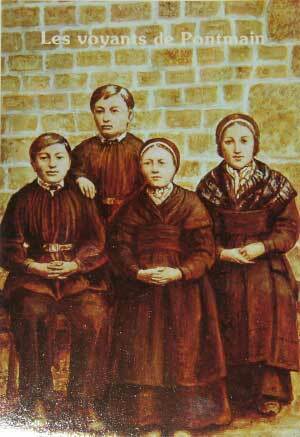 A boarder at the school in Pontmain, she lived there with the nuns Sister Mary-Timothy, Sister Vitaline and Sister Mary-Edward as well as two other young boarders, Augustine Mouton (13 years) and Jeanne-Marie Lebossé (9 years). She walked on a few steps towards the barn and then cried out at the same time as Jeanne-Marie, “Oh ! The beautiful Lady” ! Françoise and Jeanne-Marie then described this beautiful Lady, just as the boys bad done.